After an early breakfast in an empty restaurant I went back to the Tourist Office to register for racing and collect my lift pass. The races were to be held on the Furggen runs above Hannigalp. A leisurely 10 minute gondola ride takes you to Hanningalp but after that it is T-Bar access to the top. I can ride a Poma button lift pretty well with the skibike at my side, but doing the same on a T-bar, on your own, without someone else to counter weight, is a major balancing act. The snow was hard and icy to start with, not the best suited to my skibike with its parabolic carving skiboards, but I felt I could probably get down the hill without disgrace. Other entrants began to arrive, eyed me up suspiciously, then carried on their practice. I was expecting them to be fast down the hill, but it was a whole order of magnitude away from the speeds I could obtain; I was impressed how they kept their skibikes permanently carving from one edge to the other at around a 45 degree angle. After a particularly nasty moment with the T-Bar going its own sweet way and causing me to painfully twist my legs to the point of collapse, I switched to delightful run back to the village and accessed by gondola. This was much less tiring, although I had to keep removing my front ski each time to fit in the gondola. I steadily built up speed in the desperate hope that I hadn't completely lost my mountain mojo in my two month absence from the Alps. Around 3:30pm with the run becoming increasingly slushy I had a spectacularly big tumble. The skiers I had just overtaken, helped to gather up the resulting yard sale and asked politely "Are you in the race tomorrow?" I put in just one more run, then called it quits, feeling more than a little battered and bruised by the day's practice. Having showered and doused my aching legs with Deep Heat. I wandered back to the Tourist Office for the selection of race numbers. I met up with Richard Platt from the SAGB and the 3 French competitors who had all arrived that evening. After speeches by local dignitaries and even a blessing from the village priest the selection process began. I was expecting names to be drawn from a hat, but no, a slack line contest would determine your start place, those who got the furthest would start first. Having received my race vest, Richard Platt explained that he would be given lift passes later that evening for distribution at lift opening the following morning at 7:30. I thought I had better get an early night in, but my legs were now stiffening up from their earlier punishments and I needed to take a stroll to unwind and loosen up a little. Like me you have probably never heard of Grächen (also spelled Graechen) before. 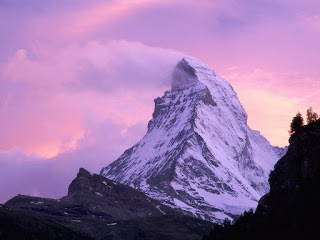 But you will hopefully know nearby Zermatt and the Matterhorn mountain that gives this Swiss valley its name. In summer Grächen has a reputation as an outstanding area for walking. Passionate hikers utilise the 250 km network of walking trails which cover the forest, lake and the entrance to the snout of the glacier. The Hannigalp (2,100 m) is the heart of the hiking region: it links the mountain path to Saas-Fee with the Europaweg (Europe Trail) between Zermatt and Grächen. In winter it has a modest 40km of pistes, but they are good runs, immaculately maintained and in the right conditions there are plenty of off piste opportunities too. The town is situated on a high plateau on the side of the Matterhorn valley, accessed by quite a narrow road. It is a little quirky and individualistic and as I was to find out later in the week, they really know how to throw a party. I had booked a room at the Turm Hotel Grächerhof using the HRS website purely in the hope that for the reasonable cost (for Switzerland) quoted, it wouldn't be a flee pit. On arrival in Grächen I located it very quickly, it looked very small from the doorway I entered, which turned out to be the original hotel entrance and now a back door to the car park. Once unpacked and settled in, I headed for the Tourist Office to make sure that my information was correct and there was indeed a skibob snow bike week taking place. I was introduced to Sylvie Margelist, the administrator for the event; she couldn't have been more helpful, but was surprised I hadn't registered for racing. She explained that tomorrow would be a practice day, I could go where I pleased, but that skibikes were currently banned from using the chairlifts in Switzerland. I went for a long walk to limber up and reflect on what I might be letting myself in for. There can't be any other sport where you can just turn up and enter a race against the best in the world; it would be like turning up for the Grand Prix at Silverstone in your Ford Focus. Injured Ex-soldier Takes To The Slopes – On A Bicycle! A soldier who lost a leg while serving in the army has taken to the ski slopes. Ex-serviceman Simon Khan, 33, had his left leg amputated above the knee eight years ago. After a difficult period struggling to come to terms with the loss, Simon became a member of the British Limbless Ex-Service Men’s Association (BLESMA) – a charity dedicated to helping servicemen and women who have lost their sight or a limb. Simon, from Weaste, has just completed a gruelling six-day rehabilitation programme of ski bobbing – a sport which sees competitors negotiate pistes on a bike – in Soelden, Austria. He went on the trip with 16 other ex-service people from across the UK, some of whom had sustained during recent tours of duty. 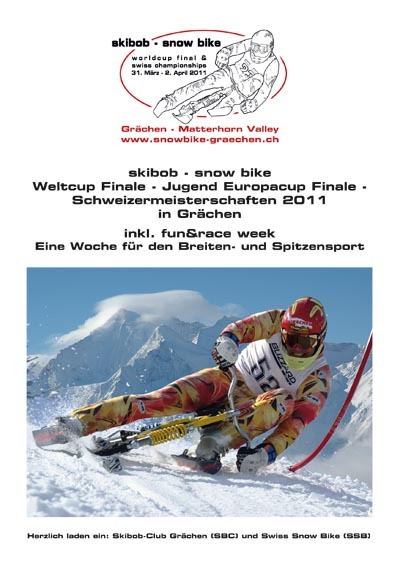 I've been invited to the Snowbike fun & race week in Grachen, Switzerland from the 27th March till the 2nd April. I had been hoping for a last minute end of season break and this sounds intriguing. A whole week in celebration of skibikes, snowbikes, skibobs or whatever else you choose to call them. I think my next adventure beckons....I'm going to have to find myself a better paid job. Les Contamines Facebook Photo Contest - Please Vote Now! I have visited Les Contamines a few times this year, it is one of my favourite places to skibike, it is also the place where I took one of my favourite photos of all time. I found myself drawn back to the image repeatedly and eventually made a version to have as my desktop background. Recently an acquaintance at work complemented me on it and the same day I found out that Les Contamines were having a photo competition, this spurred me on to enter. If you are on Facebook and want to vote for it, please do by "liking" it, to see the other images in the contest go here voting ends on the 18th March. The short ride up the Aig. Croche chairlift takes you to the highest point in the Les Contamines Hauteluce domain at 2487m. There are two pisted routes down, the steep Aiguille red run or the treacherous Croche mogulled black run. As is customary, I stopped and snapped a dozen or so overlapping images with my Sony Ericsson phone with a view to merging them together to make a panorama that evening, the sun was blinding and I couldn't see what I had taken and hoped that the images would be usable. A lot of people rushed past me, eager to start their descent and uninterested in the surroundings. A man and boy, stayed the while, surveying their options, perhaps apprehensive of the knee breaking icy mogul field below them. Later, in the calm of the flat, I downloaded the images from the phone, they were well exposed but with nothing immediately special about them. I opened Autostitch an excellent freeware panoramic image maker and loaded the selection, the computer worked away for a couple of minutes merging together elements. 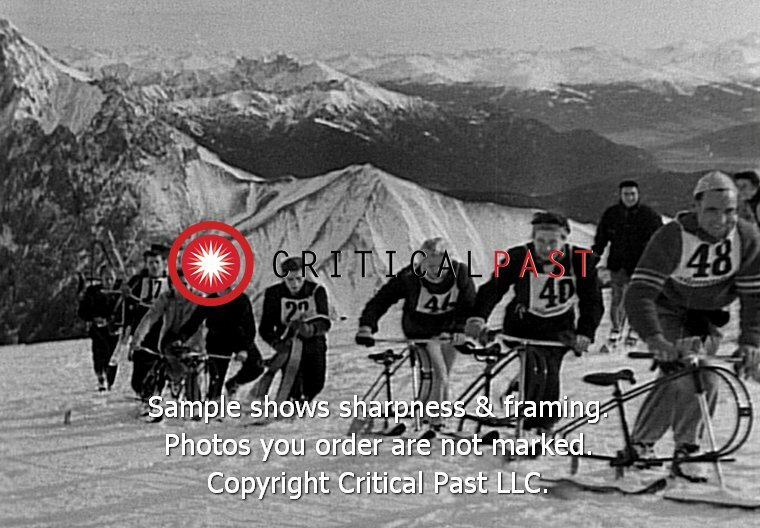 The final result was startling, all the people who had rushed past me became a vague blur, the man and boy quietly surveying the slope became more sharpley defined, yet with a little motion blur, but the mountains remained starkly defined by their indomitable nature. The rush of humans missing the awe inspiring nature of the place. The Mont Blanc in the center of the image, highest peak in Europe, our own Everest. The shed, this structured man made object, dropped into this place of otherwise pure unspoiled natural beauty, with it appears a discarded 19" server rack behind it! The permanence of landscape and yet the mercurial temporary nature of seasons and weather. I cropped the edges to square it up, and made some smaller versions for use in the blog. Another excellent vid from Maynard Schweigert unusually titled "Geezers on Snow". I thought only Cockneys used the word "Geezer" which the free on-line dictionary defines as "An old person, especially an eccentric old man". Spot on there then.